Baka-Updates Manga - Viewing Topic - BAP SCANS IS BACK!! As you read from the title, BAP Scans is back! I decided that I want to restart this group back to spread the manga love once again! I know it has been a two year hiatus but that is why I need your help even more! So we are recruiting for all positions as of current...and we know you want to be in the best family...the BAP family ;D email at bapscans@gmail.com if you are interested! Also we are looking for projects currently so if there are any interesting projects in the comments I will be sure to check them out! Hey guys!! We could really use cleaners and typesetters who are willing to do their best!! i have experience in cleaning i clean for Gos.moe too im very free and can probably clean 5-15 chapters daily. anyways back for the bump! Thankyou for all the help everyone!! We are looking for an experienced quality checker, cleaners and typesetters are not required to have any experience. You will be taught by the assistant (me). We are looking for both Japanese and Korean Translator. Editors and Quality Checker are always welcome! We need an experienced quality checker. There is a test for this. We need a Korean translator and a redrawer! We really really really need a Typesetter and a Redrawer! We need a Korean Translator and Typesetter! - - - - Live or Not! 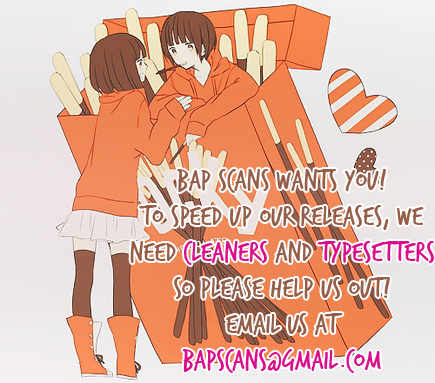 Please email us at bapscans[at]gmail[dot]com. Visit us at BAP Scans site.